Time’s alleged ‘ape-man’ trips up (again)! Readers should be aware that this is far from the only recent article that has tried to promote evolution on the basis of a few fragments of bone. Also, a claim that they’ve found the ‘missing link’ now is a tacit admission that they haven’t found it before, despite their extravagant claims! For more information on alleged ape-men, see Q&A: Anthropology. Another recent evolutionary claim was Kenyanthropus platyops, allegedly 3.6 million years old. Readers would find our preliminary response Not another (yawn) ‘ape-man’ and follow-up article New Hominid Skull from Kenya helpful.6 Readers who are already familiar with these will see the latest Time article as déjà vu. It’s a good lesson that there is no need to be frightened by the latest media anti-God proclamations—they have been discredited time after time. Another example is the alleged life from the Martian meteorite. What was the latest discovery? So, what is so special about this latest Time article? This ‘new’ find is Ardipithecus ramidus kadabba. This comes from the local Afar language: Ardi = ground or floor, ramid = root, kadabba = basal family ancestor. But this means it is just a subspecies (i.e. a variant) of Ardipithecus ramidus, which is nothing new. Time wrote about this ape-like creature (among other alleged ape-men) two years ago, Up From The Apes, and we responded on this Website. So what’s so special about this new discovery? Note that this toe was the major ‘evidence’ for uprightness, yet it boggles the mind how it could be regarded as part of the same specimen! This article is just one more example of evolutionary indoctrination by the media, but when closely examined, the evidence is found to be fragmentary and interpreted within a framework of wishful thinking. WoldeGabriel, G., et al., Geology and palaeontology of the Late Miocene Middle Awash valley, Afar rift, Ethiopia, Nature 412(6843):175–178, 12 July 2001. Return to text. Haile-Selassie, Y., Late Miocene hominids from the Middle Awash, Ethiopia, Nature 412(6843):178–181, 12 July 2001. Return to text. Gee, H., Return to the Planet of the Apes [commentary on Refs. 1 and 2], Nature 412(6843):131–132, 12 July 2001. Return to text. Pickford, M. and Semut, B., Comptes Rendus de l’Academie des Sciences 332:145–152, 28 February 2001; cited in Ref. 3. Return to text. Balter, M., Early Hominid Sows Division, Science Now 22 February 2001. This contains references to their denials published in Science and photographs of the fossils. Return to text. See also Lubenow, M., New hominin skull from Kenya, Journal of Creation 15(2):8–9, 2001. Return to text. White, T. et al., Australopithecus ramidus, a new species of early hominid from Aramis, Ethiopia, Nature 371(6495):306–312, 22 September 1994. Return to text. WoldeGabriel, G., et al., Ecological and temporal placement of early Pliocene hominids at Aramis, Ethiopia, Nature 371(6495):330–333, 22 September 1994. Return to text. Wood, B., The oldest hominid yet [commentary on Refs. 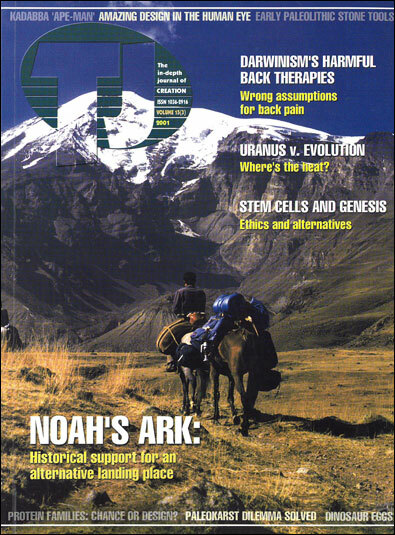 6 and 7], Nature 371(6495):330–333, 22 September 1994. Return to text. Anon., Discoveries in Africa, [editorial note about Refs. 6, 7 and 8], Nature 371(6495):330–333, 22 September 1994. Return to text. Oxnard, C.E., Nature 258:389–395, 1975. Return to text. Gee, H., Uprooting the human family tree, Nature 373(6509):15, 5 January 1995. Return to text. On the topic of taxonomic difficulties, Ref. 12 contains a box ‘Hominid and hominin’ explaining these terms, and how there is no agreement among anthropologists about which is the proper term for a given species. Return to text. Wise, K., Australopithecus ramidus and the fossil record, CEN Technical Journal 8(2):160–165, 1994. Return to text. Batten, D., Australopithecus ramidus — ‘the missing link’? CEN Technical Journal 8(2):129–130, 1994. Return to text. Anon., Ref. 9, p. 270. Return to text. About Lucy’s status as a missing link, see Oard, M., Did Lucy walk upright, Journal of Creation 15(2):9–10, 2001. This cites research by evolutionists showing that Lucy had wrist characteristics ‘classic for knuckle walkers’. Return to text.